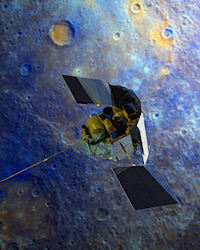 March 15, 2011: On March 17th, NASA's MESSENGER probe will become the first spacecraft to orbit Mercury. It's a seminal moment in planetary exploration. Researchers can finally take a good long look at a rocky world that is both akin to Earth and shockingly alien. "Mercury is going so much faster than Earth that a spacecraft must gain about 65,000 mph to catch it. And once you get there, you're face to face with the searing heat of the sun." Only Mariner 10, which flew past the small planet briefly in 1974 and 1975, and MESSENGER itself have made the attempt to go there. Even after MESSENGER's own flybys in 2008 and 2009, Mercury remains the least explored planet. Deep in the sun's gravitational well, Mercury is the planet most subject to the sun's powerful grip. The closer a planet gets to the sun, the faster it has to travel to balance the pull of gravity. Mercury travels at an average speed of 106,000 mph. "MESSENGER must gain tremendous speed to catch Mercury," explains McAdams. "That's quite a challenge with current propulsion systems. But Chen-wan Yen, an engineer from JPL, came up with a clever trajectory that uses gravity assists from Venus and Mercury. I started with that trajectory, adding additional flybys to adjust both the launch and Mercury arrival dates." The resulting loop-de-loop path MESSENGER has followed to slip into planet number one's orbit has covered about 5 billion miles, including 15 loops around the sun, and flybys of multiple planets. As a spacecraft flies by a planet, the tug exerted by the planet flings the spacecraft in a new direction, giving it a boost and reshaping its orbit. The final itinerary for MESSENGER included flybys at Earth, Venus and Mercury itself to accelerate the spacecraft and deflect its path inward toward Mercury's path – all using very little fuel. Meanwhile another challenge awaits – Mercury's "warm" welcome. The sun blazes up to 11 times brighter there than at Earth, and surface temperatures at Mercury’s equator can reach 450 degrees Celsius (840 degrees Fahrenheit). The small planet's hot dayside radiates much of that thermal energy back into space at a rate four times that at Earth. Watch this animation to view the Mercury orbit insertion maneuver and the spacecraft’s first orbit around the planet. "We solve this problem with a large sunshade made of ceramic fabric that withstands heat and protects the rest of the spacecraft," explains principal investigator Sean Solomon. "And the mission is designed to limit the time the spacecraft spends over Mercury's hottest areas." Other high-tech materials are used in the solar arrays and science instruments to keep them within their working temperature ranges. Researchers are anxious for new discoveries at Mercury. It's a planet of many mysteries: the most active planetary exosphere in the whole solar system, a surprisingly "live" magnetic field that has puzzled scientists for years, a core that makes up 60% of the planet's mass and is at least partially liquid, an intriguing landscape pitted with an interesting variety of craters and volcanic vents and marked by towering scarps that snake hundreds of miles across the planet's face. And that's just for starters. MESSENGER is bristling with scientific instruments – high resolution imagers, lasers, and magnetometers – designed to solve these mysteries once and for all. Imagine you want to hop a train from a moving car (don't try this at home!) The train is traveling 60 mph along the tracks paralleling Main Street and will be passing the General Store at precisely 1 p.m. You're primed for action, parked along Main Street in your car. At 12:59:30 you start accelerating down the street to intercept the train. Your car's starting point is closer to the General Store than where the train is now, but the train is going faster (60 mph), in the same direction you're going. As you speed up to 10 mph relative to your starting point, you're going 50 mph in relation to the train. As you keep increasing your speed relative to your starting point, your speed relative to the train decreases. You're closing in! You time your acceleration to pass the store at 60 mph at the same moment the train passes it. At that moment you're going zero mph in relation to the train. Now leap! Similarly, once MESSENGER approaches Mercury at the right speed, it can fire its main engine enough to be captured by the planet's gravity and begin orbiting. It would take a team of people driving a car at 56 mph 10,000 years to travel the 4.9 billion miles traveled by MESSENGER around the Sun in only 6.6 years. What does MESSENGER stand for? It stands for MErcury Surface, Space ENvironment, Geochemistry, and Ranging spacecraft. Why orbit Mercury? Orbiting Mercury for a year will allow scientists to study Mercury in detail and answer tantalizing questions raised by our previous glimpses of the small world. Many of the answers to the questions require measurements at Mercury (such as characterizing the planet’s magnetic field) or long-term observations. Also, MESSENGER will move more slowly in orbit than in a flyby, allowing cameras to zero in on intriguing features seen only at a distance up to now. The cameras will have 250 meter resolution but can do 25 times as good as that when they zoom in. Why does Mercury travel so fast? The sun's gravitational pull is stronger the closer you are to the sun, so a body has to move faster to keep from being pulled down. Think of swinging a rock on a string. The shorter you make the swing, the faster you have to spin it faster to keep it going around. That's because any orbit is just the right balance between the inward pull of gravity and the innate tendency of objects to travel in a straight path. What would have to be done to enter Mercury's orbit with MESSENGER if you didn't use flybys? McAdams answers: "About 54% of MESSENGER’s launch mass was propellant. Much more fuel would have been required without the flybys. Flybys save fuel. There are design and cost challenges with having to increase the percentage of propellant to over 85% of launch mass. Launch costs alone could have equaled the entire mission cost (development, spacecraft, testing, launch, and operations)." What would a direct shot on an intercept course with Mercury require? McAdams answers: "If you sent a spacecraft directly to Mercury on a huge rocket with stacked upper stages, you would need a rocket with many times the lift capability of the Delta II (i.e., Delta 2) that sent MESSENGER toward Mercury. After leaving Earth orbit, the spacecraft would need nearly 2.5 times (150% increase) the propellant loaded onboard to place the spacecraft into the desired orbit around Mercury." How many flybys were there and when did they occur? There were six flybys: one at Earth, two at Venus, and three at Mercury. The Earth flyby, a year after launch, and the Venus flybys, in October 2006 and June 2007, used the pull of the planets’ gravity to guide MESSENGER toward Mercury’s orbit. 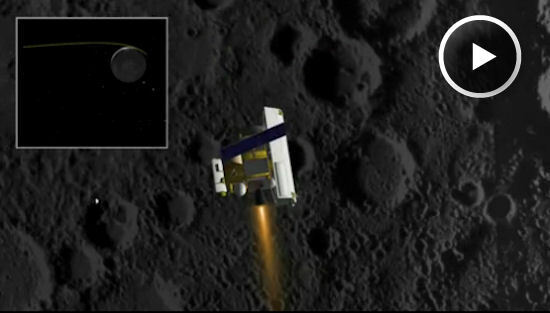 The Mercury flybys in January 2008, October 2008 and September 2009 fine-tuned and shrunk MESSENGER’s orbit closer to the size of Mercury’s orbit while allowing the spacecraft to gather data critical to planning the mission’s orbit phase.